Lady Jae Broomhall has written an epic book, published throughBooksurge and available online. This massive tome is a full 632 pages of information. My copy arrived on June 4th, the day I left on a spiritual retreat, and by the time I returned on June 14th, the front cover and several pages were curling horribly. The physical quality of the book is very low. The binding, despite almost no use and extremely careful reading on my part, was beginning to break by the time I was done reading it. The title of the book warned me to be nervous. I have been a Wiccan priestess for over 20 years, and although my own spiritual path has led me elsewhere, I still honor and revere my Wiccan teachings. In 20+ years of learning, I have never met any Wiccan angels. The term “white witchcraft” also had me concerned, as British Traditional Witchcraft (which is the oldest modern form of Witchcraft) does not use the terms “white” or “black.” Immediately, my fears were unfortunately verified. On the very first page of the book, Broomhall quotes “a Wiccan rede” and then states that it is a law given to “all spellcasters.” There are very few things you can say apply to all Wiccans, but in this case I feel safe stating that there is no law (outside of the law of whatever land we live in) which applies to all Wiccans. The Rede of the Wiccae, written by Lady Gwen Thompson (or her grandmother, depending on who you ask) is the Rede which most Wiccans refer to, and it is not a list of laws but of suggestions and moral guidelines. Indeed, the very word rede means counsel or advice, nothing more. Lady Gwen’s version of the Rede is not mentioned at all within Broomhall’s book. Broomhall talks of “our time of persecution” (pp. 6) and the distortion of knowledge to save it. Enough books on Wicca and witchcraft historicity have been written that I do not feel it is necessary to reiterate the fact that Wicca is a modern religion, started in the 1930s and 40s by Gerald Gardner. While it is possible that there were remnants of older cults dating into the middle ages, it is unlikely that they bore any resemblance to what it is we do today. While this book proclaims itself to be a workbook for those of the Wiccan faith (pp. 8), there is very little of Wicca, if anything, within its covers. It refers to angels, to the God of Moses and Abraham, to ancient Egyptian, Greek, Syrian, Mesopotamian and other magical systems. The Bible is referenced many times throughout the book. While there are a few minor mentions of goddesses, it is heavily implied (or outright claimed) that they are actually angels. To those who practice Wicca and are intimately in tune with her deities, this book would be considered horrendously offensive. Within the book are a number of quotes with no attributions. One of these, on pp. 276, states that Wiccans all believe in reincarnation (this is not true), and therefore if you’re sad or upset or grieving at a funeral you are simply wallowing in your own “selfishness and self-pity.” I cannot imagine saying this to a family who is mourning the loss of a loved one. I have known many Wiccans over the years and each and every one of them was accepting and encouraging when it came to the process of going through the stages of grief. The bulk of the information within the book is a mish-mash of old texts dealing with everything from Ceremonial Magick to modern day reconstructionism. It is poorly written, and the text is rife with spelling and grammatical errors. Unfortunately, even the layout and images within the book are of little use, because they are not accurately accredited. No primary texts appear to have been used in this book, and no references are made in a way that can be looked up or duplicated. Fact checking would be overly tedious, and largely pointless. 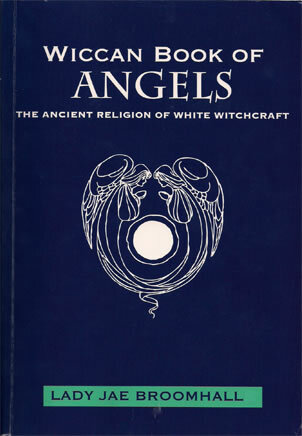 At a hefty suggested retail price of $31.99 USD, this book is really useful only as an oddity, or if you have a very deep interest in what angel names have been used throughout the ages. A warning, though: Broomhall doesn’t give any references, so it’s almost impossible to check whether her information is good or not. One easy to check example is her claim that the Hebrew language has an alphabet that is twenty-seven letters long (pp. 464), when it actually contains twenty-two letters. While much of the information given to British Traditional Wiccans is considered secret, the most accurate public information can be found in books such as Buckland’s Complete Book of Witchcraft (Llewellyn’s Practical Magick) by Raymond Buckland, A Witches’ Bible: The Complete Witches Handbook by Janet Farrar and Stewart Farrar (not completely historically accurate, but does give the reader an excellent view into the world of modern Wicca), and The Circle Within: Creating a Wiccan Spiritual Tradition by Dianne Sylvan. These three books (and other books by these authors) cover widely different viewpoints of Wicca both historically and in the more modern setting. Each touches on a different type of Wicca, and focuses on what can be done by solitary practitioners, small groups, with some small information for larger groups. For those interested in working in larger groups or covens, or with the public, I highly recommend Coven Craft: Witchcraft for Three or More by Amber K, which covers every aspect from teaching to advertising to ethics and morals. If your interest lies more with Ceremonial Magick, a much more concise and better laid out set of information can be found in The Golden Dawn: The Original Account of the Teachings, Rites & Ceremonies of the Hermetic Order (Llewellyn’s Golden Dawn Series) by Israel Regardie. The book covers every aspect of the occult teachings of the Golden Dawn, which are similar to the angel workings within Ms. Broomhall’s book.